A licensed insolvency practice offering business support and help as well as risk assessment, to both the commercial and domestic market. To create a new brand to accurately convey the company's unique approach to solving financial problems and supporting those having financial difficulties across a wide range of target markets. After extensive brainstorming with the client and encouraging them to focus on their core values and brand strategy we were able to conceptualise a softer and more positive approach and communicate their 'iron fist in a velvet glove' analogy using unexpected imagery. 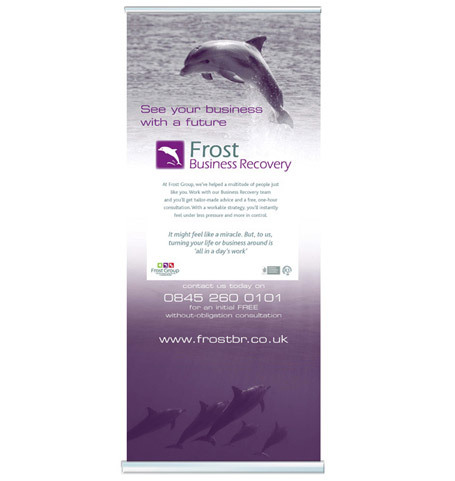 Icons were created from a dolphin, a sunflower and dice to reflect the differing areas of 'Business Recovery', 'Debt Solutions' and 'Rick Services' we used vibrant colours and modern business typography to communicate modern practices and modern thinking in a very tricky area of finance. Hand holding and support whilst delivering no nonsense practical advice and guidance were communicated using clean lines AND soft edges, bold imagery and strong copy bringing the whole identity together in material and website. The three icons and their colours where brought together for the Group Identity, creating an impactful and memorable brand.